Lockers within a changing room could be hard to maintain especially from both a cleanliness as well as handling perspective. In most cases what you have are filthy lockers stinking with a weird smell and badly maintained. While in other cases changing room lockers UK do not open up that easily making the situation too complicated. At this point not just health is at stake, but man handling in a wrong manner could cost you a hefty amount if in case you have roughly used your lockers resulting in the loss of gym, club, health clubs, or whatever premises you are present. The bacteria that strives in a filthy locker is the very well known E Coli bacteria and not to forgot other germs also thriving in such an environment. While you are running on a treadmill, these bacteria or germs are just getting multiplied in numbers. Not just the changing room lockers UK but these bacteria spread even onto the fitness equipment through your hands or others. In fact, as per a study the fitness equipment surprisingly are bound to have over 300 times more bacteria than a toilet seat. Ensure to keep away your gym kit whether clothes, towel, or other things as much away possible from changing room lockers UK that appear to be old or filthy. Ideally, changing room lockers UK need to be the most cleanest place around, but unfortunately the reality is completely different. A good changing room locker has to be the one that keeps things incubated from germs from within inside. There are lockers with a high-gloss anti-bacterial coating that tends to reduce the spread of bacteria by almost 99%. What kind of design parameters a changing room locker must suffice? 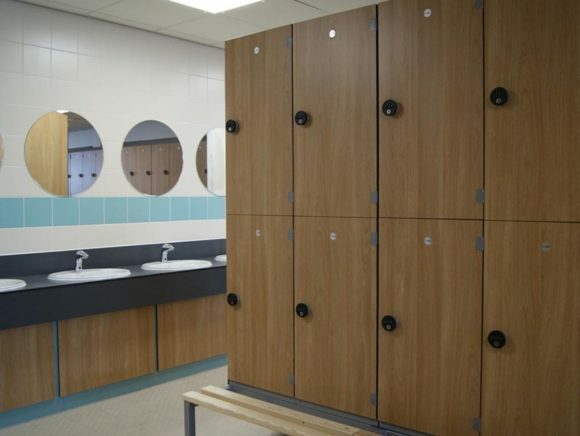 Changing room lockers UK is an absolute vital component of a club, health facility, or a gym. It cannot be an afterthought since members leave their pricey possessions while keeping complete faith on these lockers. The lockers need to be designed in such a way so that spacing on the inside can accommodate all the underlying things of a member whether big or small. There are three key ingredients to design into the locker for accomplishing a user-first changing room. You cannot have too much stuff lying around inside a changing room while challenging a changing room capacity to ultimate limits. It is not a practical place to overstuff things since that’s what changing room lockers UK are meant for. A changing room should have enough spacing for people to change their clothes, take a shower, opt for a steam or sauna, or just socialize. Hence, big changing room lockers can have too manu valuable things stores allowing a changing room to appear organized. Changing room lockers UK should be such designed that from the time members enter the room, they feel highly safe regarding storing their valuable things in such a locker. The lockers need to be adequately safe enough so that no one can just walk in and barge into your belongings. The complete possession of the locker should be in the hands of respective members so that there is no insecurity with regards to theft. You need to have right lockers having the potential of keeping away the unwanted visitors as well as built in a way so that they are moisture resistant and easy to clean. Once bare necessities of the changing room lockers UK are met with, any extra surprise offerings only enhances the overall customer experience. These offerings could be in the form of plugs for charging, free hair dryers, in-built mirrors, or probably other things. Such offerings would be highly appreciated since they came unexpectedly from nowhere. Hence, it is advisable to have these things incorporated for the best products. With the health facilities, clubs, or gyms facing a cutthroat competition from one another, it does not come off as a surprise to see these facilities upgrading their changing room lockers UK in the best possible manner so that right premises have right kind of lockers in place. Old style lockers might be robust with a sturdy appeal but as they grow older, it can be hard to save them from wear and tear as well as hard enough to install extra modern recreation facilities within them. Nowadays, a paradigm shift is taking place with best possible arrangements integrated within the locker. This had resulted in lockers being the focal point for planning out a recreation center. Let us look at the current trends in a changing room locker most preferred across the globe. Contemporary locker rooms are meant to be safe, easy to maintain, durability on a high, easy to clean, and can be used by members with ease. Only a good locker maker has the ability to have all these qualities built into one locker. Cabanas are highly useful for storing diapers, shoes, clothes, towels, and so much more. Additionally, they allow aged members with disabilities to have a private convenient access to all the amenities within a locker room. Cabanas have an added advantage to safeguard gender orientation concerns as well as provide a level of privacy to patrons with injuries. Additionally, cabanas provide with a great convenience and privacy since an assistant accompanies you and aids you personally with a range of facilities. As social scenario goes for a shift, it is clearly evident how evolution has taken place with lockers within a premises to meet those evolving needs of a member. Irrespective of the facility starting from the ground up or having an established presence, changing room lockers UK are an evident part of innovate design and planning of a recreation center. This entry was posted on Saturday, February 2nd, 2019 at 6:25 am	and is filed under Lockers Online. You can follow any comments to this entry through the RSS 2.0 feed. You can leave a comment, or trackback from your own site.